Yep. That’s the main feature of my week! As many of you will know, this Friday (26th of September) sees the Macmillan Coffee Morning, and my mum and I are holding one in the staff rooms at work. Sometimes it’s handy working in the same place as your mum! So this means I have to bake bake bake. Not that I’m complaining really, I love baking. So I thought I’d share some of my baking with you! I realise this isn’t something I’ve done on this blog before, but I’ve thought about it, so I thought I would test the waters with a super easy, and super yummy, recipe! 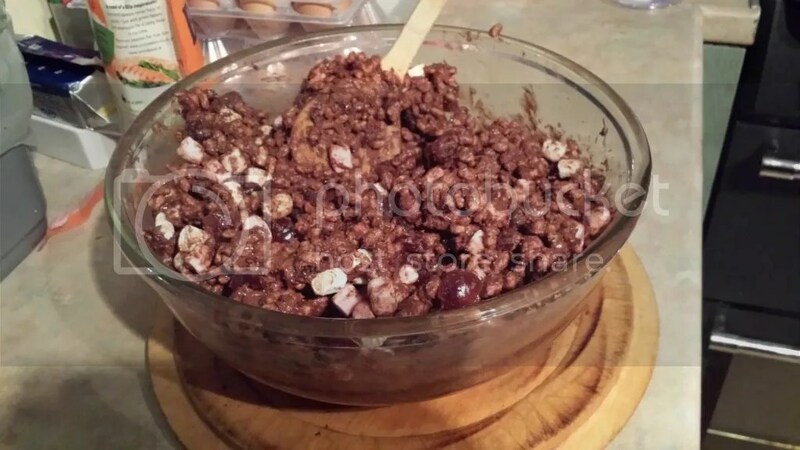 2) Once the chocolate is all melted, take half a bag of marshmallows (85g) and stir them into the chocolate mixture, still over the heat. 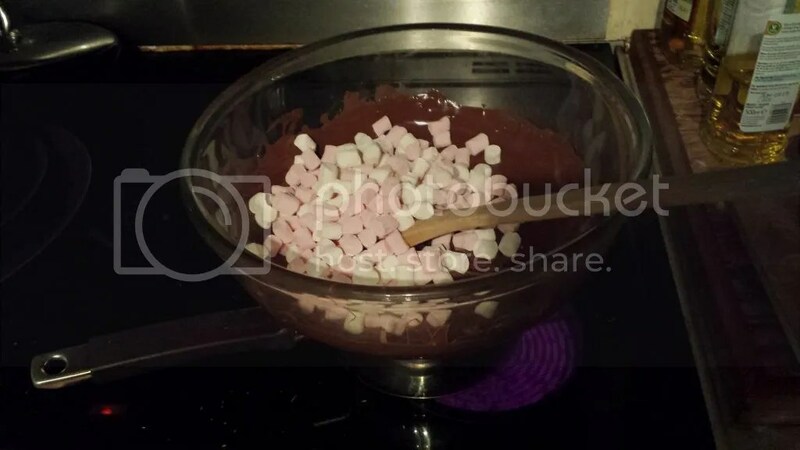 You want the marshmallows to start melting and combining with the chocolate, to make a sticky, gloopy, wonderful mess. 3) When this is done, take the bowl off the heat and stir in the rice snaps and the rest of the marshmallow. Make sure you really scrape the bottom of the bowl and get it all incorporated. 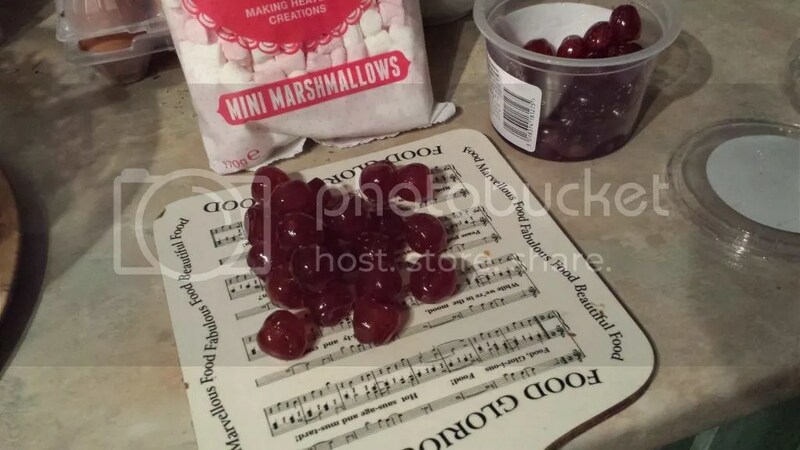 4) Take the glacé cherries and chop them up roughly. You want all sorts of different sized pieces, don’t worry too much about keeping them a regular size. 5) Stir the cherries through, and give the whole mixture one more great big stir, making sure you get right to the bottom and off the sides of the bowl. 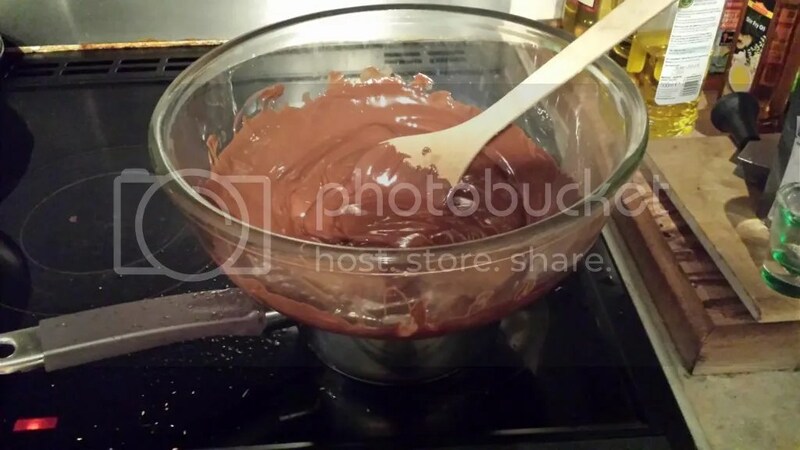 6) Spread the mixture out onto a baking sheet lined with aluminium foil. Refrigerate for a few hours, I would keep it in the fridge at least overnight. When everything is set, hack it into chunks and enjoy! There are lots of variations you could make to this recipe. 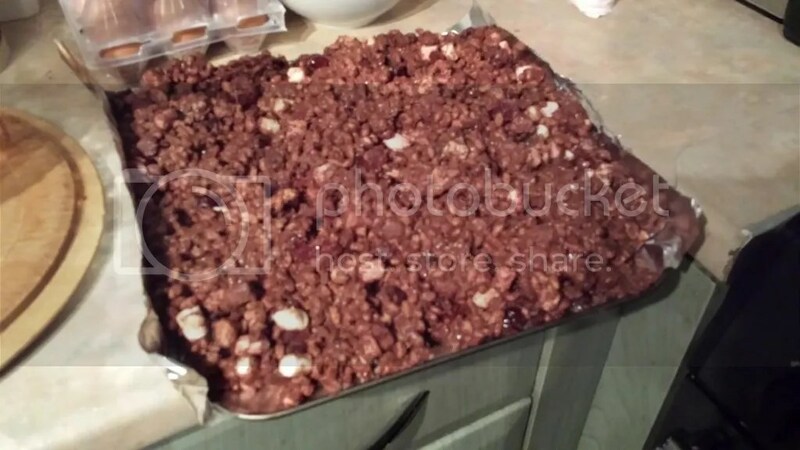 The chocolate, marshmallows and rice crispies are the base ingredients. To make a really fudgey treat, you could add a little butter and golden syrup when melting the chocolate; or maybe try adding different kinds of dried or preserved fruits? 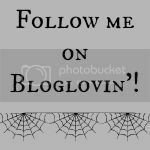 I think I will make Halloween treats by adding horror-themed treats instead of the second load of marshmallows! 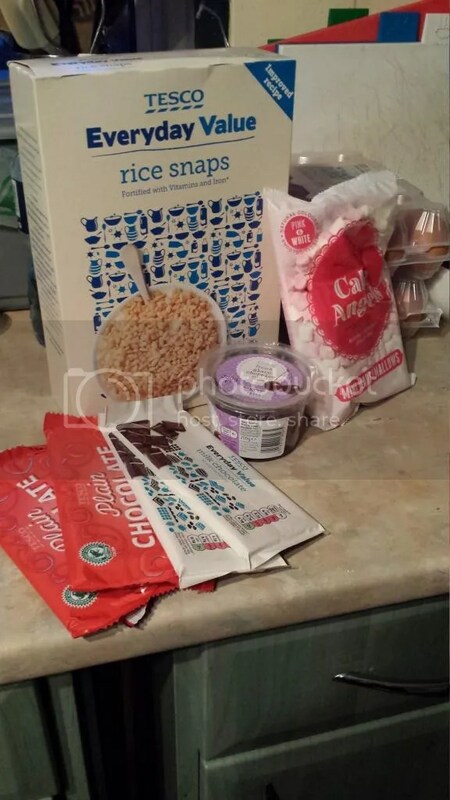 This entry was posted in Food/Recipes/Nutrition, Lifestyle and tagged cherries, chocolate, chocolate treats, coffee morning, macmillan, marshmallows, recipe, rice crispies, rice snaps, treats. Bookmark the permalink.